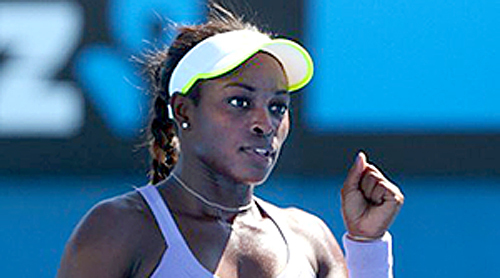 FROM TORONTO, THE ROGERS CUP, THURSDAY, AUGUST 10 — Sloane Stephens is coming back strong, upsetting Petra Kvitova and Angie Kerber in Toronto. While she was off for almost a year, she increased her practicing and got better. American Stephens was hurt last year and had foot surgery. She stopped playing in August 2016. She returned to play on the WTA Tour at the end of last June. The 24-year-old reached the semis at the 2014 Australian Open, upsetting Serena Williams before losing against Vika Azarenka, who won the event. She cracked the top 10 that year. She didn’t do much in 2015, but in 2016, she won Auckland, Acapulco and Charleston before her injury stopped her stellar progress. She said that before she came back at the tour, she practiced a lot and she is trying to improve. “There was a lot of things I needed to improve. I was on a peg leg for, like, 15 weeks, so I couldn’t do anything,” Stephens said. “I was walking on that stupid thing. And then when I first started actually hitting on the court again, like, I couldn’t run full on. I couldn’t do anything. She will face against Lucie Safarova, who has already beaten Dominika Cibilkova and Ekaterina Makarova, on Friday.